Standout in TV Westerns also appeared in dozens of shows like "Maverick," "Black Saddle" and "Branded." Peter Breck, who played a hot-headed son of California ranch owner Barbara Stanwyck on the 1960s TV Western The Big Valley, died Monday in Vancouver after a long illness. He was 82. Before the 1965-1969 ABC series, the hark-haired, rugged-looking Breck had worked as a regular on two other TV Westerns: Maverick, as Doc Holliday opposite James Garner, and Black Saddle, on which he played a gunman turned lawyer opposite future Gilligan’s Island actor Russell Johnson. A native of Haverhill, Mass., and the son of a jazz musician, Breck scored a contract at Warner Bros. and appeared in dozens of shows from the mid-1950s to the early 2000s, including The Virginian, Hawaiian Eye, Perry Mason, Lawman, Branded, Gunsmoke, Fantasy Island, The Fall Guy and John Doe. His film work included roles in Thunder Road (1958), I Want to Live! (1958), The Beatniks (1960), Portrait of a Mobster (1961), Lad: A Dog (1962), Samuel Fuller’s Shock Corridor (1963) and Benji (1974). On Big Valley, Breck played Nick Barkley, who lost his temper easily and was often spoiling for a fight. Nick was the brother of the characters played by Richard Long, Charles Briles and Linda Evans and the half-brother to Lee Majors. He stayed close with Stanwyck after the show finished production. In the mid-1980s, Breck moved to Vancouver, worked in theater and opened an acting school. His wife of 51 years, Diane, wrote on his website that he was suffering from dementia and had been hospitalized since Jan. 10. Born: 3/13/1929, Rochester, New York, U.S.A. I was so sorry to hear about the passing of Peter. Another fine actor gone too soon. My thoughts and prayers are with the family at this most difficult time. Deeply saddened by this loss. RIP, Peter. So Sad. A great actor, and an overall nice guy. So unappreciated by Hollywood. RIP Peter. 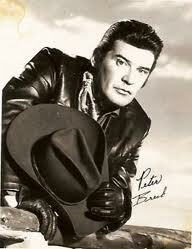 Peter Breck will be greatly missed. His acting was one of the rare count. I will lift up his family in prayer in Jesus' name. His presence in this world was inspiring & we are at a sad loss.